The traditional gala evening of the Finnish game industry, The Finnish Game Awards, whas recently been held in Helsinki. The biggest winner of the evening with two awards and the people’s choice trophy by the Pelit magazine was indie game studio Colossal Order with their critically acclaimed building sim – Cities: Skyline. A total of nine awards were presented during the gala evening. The Finnish Game of the Year 2015, the Small Screen Game of the Year 2015 and the Big Screen Game of the Year 2015 were selected by the members of the Finnish Game Developers’ Association. 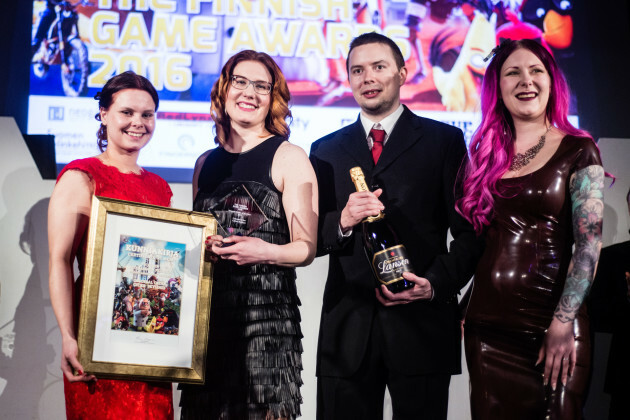 The Applied Game Award 2015 was selected by the Serious Gaming Cluster Finland Association. 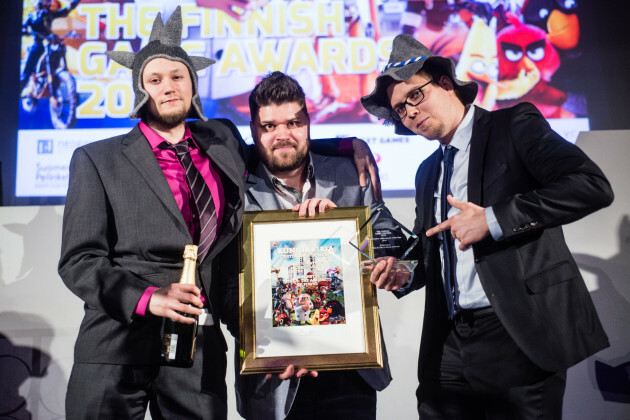 The Creative Achievement of the Year 2015 and the Finnish Rookie of the Year 2015 were chosen by the board of the Finnish Game Developers’ Association. And finally the Sensation of the Year 2015 was picked by the Neogames Finland Association. IGDA Finland also presented their recognition to volunteers of the year 2015 and the gaming magazine Pelit gave away their traditional “Kyöpeli” trophy to the people’s choice game of the year 2015. Serious games are a growing industry for games and game-like elements that have a primary purpose of other than pure entertainment. This year for the first time, the Applied Game Awards was given as a recognition of not only to the award-winning game and its developers, but also to the entire serious gaming sector. Money Flow Challenge is the first educational game in Finland aimed for students that helps them understand personal finances. The Finnish game industry grew by about 30 new game studios in 2015. The Finnish Rookie of the Year 2015 award went to one of those, Koukoi Games that comes from the Northern Finland’s capital: Oulu. Despite of the company’s young age, Koukoi has already received significant external funding and company’s first game, Crashing Season, was soft launched in December 2015. Sometimes game development or finalizing the game release can take a long time. The development of Little Knight Arthur took place 1985-1986 in era of Commodore 64 and it was published 30 years later in January 2016 to the original platform. However, the most important thing is probably that the game was released and is now available to all consumers as a reminder of the time when the game development first began in Finland. Like its predecessor, Trine 3: The Artifacts of Power is visually, gameplay-wise as well as musically a breathtakingly beautiful game. Playing Trine 3 is an experience on several emotional levels. Colossal Order game studio’s Cities: Skylines is the game that has been written and talked about a lot. Cities: Skylines is Colossal Order’s mighty vision of the game genre which was previously dominated by the giants of the game industry. However, Cities: Skylines’ success shows that a small, but professional indie team can develop a game that even the giants have to recognize as their superior. Zorg Entertainment’s futuristic racing game AG Drive has wrongly remained rather hidden from the public. AG Drive is an epic action-packed racing game where too much speed is still too little. AG Drive is very much a game made for players. Colossal Order´s triumph continued also in The Finnish Game of the Year category. The future will tell whether the Cities: Skylines is going to be one of the true classics of Finnish game industry or not. At least it has all the qualifications to become one. Like the previous two years, The Finnish Game Awards was organized by the Finnish Game Developers’ Association and the Neogames Finland Association. The gala evening was sponsored by the game studios Dodreams, Next Games, Supercell, Rovio Unity, Colossal Order, Fingersoft, Redlynx, Rovio and Seriously and velocity capital company Pollen VC.